Strategically berthed in Falmouth, Massachusetts, The Bluefin is within quick striking distance of the shoals and rips off Martha's Vineyard, Nantucket, Monomoy, the waters east of Chatham, the Elizabeths, and a short ride through the canal to the fertile waters of Cape Cod Bay and beyond. 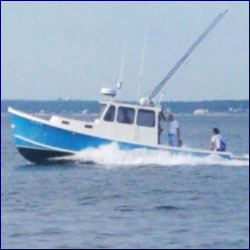 Specializing in family sportfishing adventures, Bluefin Charters offers a wide variety of full and half day charters to suit your needs and wants. Full and half day inshore charters for big striped bass, bluefish, bonito, and albacore are very popular, as are full and half day deep sea bottom fishing charters for fluke, or black sea bass and porgys (scup). One of our most popular options is our "Combo" trip. The "Combo" trip consists of two hours of trolling for striped bass and bluefish, followed by two hours of bottom fishing, either fluke, or black sea bass and scup. This trip appeals to groups of all types because of the fast action and close proximity to port. 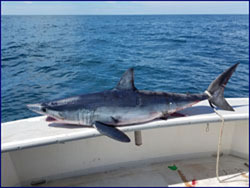 Bluefin Charters offers big game offshore adventures featuring sharking or tuna, all day trips. Available July through October, with a four person maximum on all offshore trips. Call Capt. Brian for details. Call Capt. Brian Courville today at 508-292-3244 to make your Cape Cod fishing trip not only a reality, but truely a memory that will last forever!